I tried making something new this summer - Homemade Ketchup. Let me tell you, it's delicious! I had thought about making it last summer but I wasn't convinced that the taste and consistency would even compare to the well known Heinz brand. I was pleasantly surprised to find that it tasted even better than Heinz Ketchup. Seriously! The consistency has room for improvement but it's pretty close. You really need to simmer it for a LONG time before it starts to thicken up. I simmered mine for a little over 2 hours and it still could have used a little more time. I've seen many recipes over the years for homemade ketchup but it wasn't until I got my hands on the book, Canning for a New Generation, by Liana Krissoff, that I knew I had found the one for me. I have borrowed this book from the library several times and fell in love with it more and more each time. Not only is it filled with amazing canning recipes, but it also has recipes for you to use your preserves in! Pie, cobbler, tarts, curry, chili, soups, you name it. On top of all that, it has excellent step by step instructions and endless tips on everything. My wonderful mom just bought it for me last week for my birthday, so I now have my very own copy! Thanks, mom! Here's the recipe for you. I doubled it and I went a little easy on the spices. In a wide, 6- to 8-quart preserving pan, hear the oil over medium heat. Add the onion and garlic and saute, stirring frequently, until the onion is translucent and soft but not browned, 5 to 7 minutes. Add the remaining ingredients and cook, stirring occasionally, until the tomatoes are very soft, about 30 minutes. Pass the mixture through a strainer or a feed mill fitted with the smallest holes to remove the seeds, or puree the mixture in a blender in batches then push it through a sieve. Return the puree to the pan. Bring to a boil, then lower heat and simmer, stirring frequently to prevent the solids from sticking at the bottom, until thick, this could take as long as 2 hours, depending on your patience and your need for thickness. Taste, and add more vinegar or sugar as necessary. Ladle hot ketchup into prepared jars, leaving 1/4 inch headspace at the top. Use a damp paper towel to wipe the rims of the jars, then put a flat lid and ring on each jar, adjusting the ring so that it's just finger-tight. Return the jars to the prepared water in the canning pot, making sure the water covers the jars by at least 1 inch. Bring to a boil, boil for 20 minutes to process. Remove the jars to a folded towel and do not disturb for 12 hours. After 1 hour, check that the lids have sealed by pressing down on the centre of each; if it can be pushed down, it hasn't sealed, and the jar should be refrigerated immediately. Label the sealed jars and store. Adding the spices. This is when the lovely aroma begins! The tomatoes are soft and ready for pureeing. After going through the food processor in several batches and strained through a sieve. This is what didn't make it through the sieve. We are loving this ketchup on our veggie burgers and veggie dogs. It has also been great with grilled cheese and homemade fries. I think it will make lovely Christmas gifts. I love putting together a basket of my homemade preserves, along with other little goodies, to share with friends and family during the holidays. 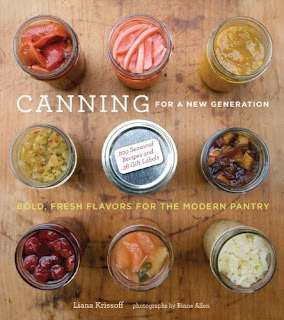 If you like canning or are interested in learning more about it, you will love this book!